Recently, the Federal Circuit overturned years of precedent in the case of Monk v. Shulkin, F.3d (April 26, 2017). 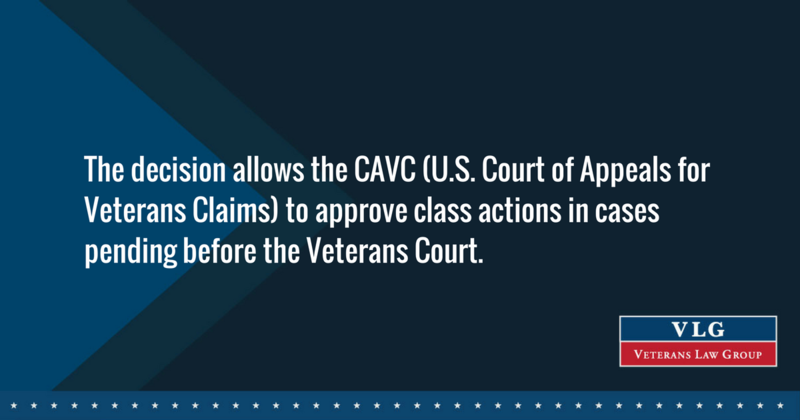 The decision allows the CAVC (U.S. Court of Appeals for Veterans Claims) to approve class actions in cases pending before the Veterans Court. Class actions come into play when many litigants/claimants are in a similar situation. That is, they allow a large number of claimants, who share the same or similar issue(s), to join together in one representative action. Typically, the class picks a lead claimant, who will represent the entire class. If the lead claimant wins the action, so does the entire class; and, of course, if the lead claimant loses, so does the entire class. One benefit of a class action is to avoid the problem of a case becoming moot. A case becomes moot when there no longer remains a dispute between the parties. EXAMPLE: The VA has unreasonably delayed, perhaps for two years, the scheduling of a VA examination for your client, without disputing the client’s right to a VA examination. In this circumstance, an attorney files an individual petition for a writ of mandamus (WRIT) before the Veterans Court, alleging the VA’s unreasonable delay of scheduling the examination. Following the petition, the Veterans Court orders the Secretary to respond to the allegations in the petition. Faced with this order, the VA schedules the client for a VA examination and informs the Veterans Court. At this point, the case is moot because there no longer remains a dispute – i.e,. the client received what he requested, the scheduling of a VA examination. Consider now another scenario. A VSO office has noticed that many of its clients, say, as many as 100, have waited over two years to have their VA examinations scheduled. Instead of filing individual petitions before the Veterans Court for each and every affected client, your office can now group all the clients (claimants) in one class action petition. With a chosen lead claimant, the petition will allege that two years is an unreasonable delay for all members of the class. Even if the VA agrees to schedule a VA examination for the lead claimant, the class action is not moot. To render the class action moot, the VA would have to schedule examinations for all the class members. The Veterans Law Group would be happy to assist any VSO office in preparing a class action.